First American release for one of the leading lights from the Agadez guitar scene. Koudede Maman finally steps out of the shadows and delivers two scorching tunes recorded live from the European tour of last year. The sinuous sound of the electrified West African guitar has long mesmerized listeners both at home in the Sahel and abroad, from the explosion of global phenomenons such as Tinariwen and Abdallah Oumbadougou to the recent emergence of the rawer sounds of Group Bombino and Group Inerane. Linking these first and third waves of the Tuareg guitar revolution is Koudede, an enigmatic figure who has stepped out of the shadows as one of the strongest songwriters of the Sahel scene. The Tuareg guitar revolution is inextricably linked to the the all-too-familiar struggle between a nomadic people whose age-old ways of living are bound to the landscape and the rise of modern nation-states and their categorical usurpation of the limited resources in a region. Like the sounds of those who came before and after him, Koudede’s music is forged in the fires of such political unrest and struggle. Born in Agadez (Niger), Koudede grew up in in the dust of the uranium mines of Arlite, between the foothills of the massif of Aïr and the sands of the Sahara. In his youth, Koudede joined the uprising and left Niger to take up arms in the rebel camps of Algeria and Libya. It was here that Koudede discovered the galvanizing force of the Tuareg music scene. 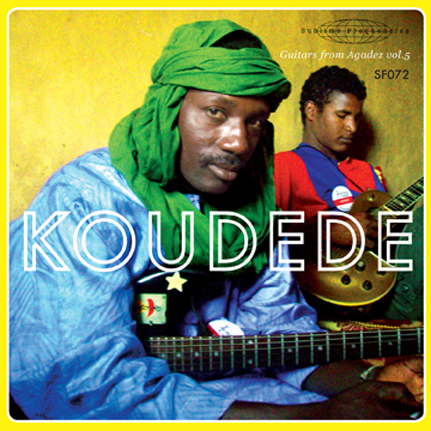 From the young visionary who made his first guitar out of a tin can to his current avatar as the heir apparent to the legacy of Ali Farka Toure in West African guitar music, Koudede has blazed forth from a relatively small following in Agadez and Niamey to take the world by storm. His songs are rooted in the poignance of Tuareg lore, speaking of migration, of warrior virtues, of distant camps and difficult loves, and at the same time they reverberate with the modern chaos of warfare and the contemporary Tuareg crisis. This is the truest music of revolution - where the transcendence of historical poetry and the daily grit of human struggle are in dialogue, from verse to verse and refrain to refrain. Sublime Frequencies is proud to present the latest manifestation of Koudede’s musical journey. 7 inch, limited ed. one time pressing of 600 copies.